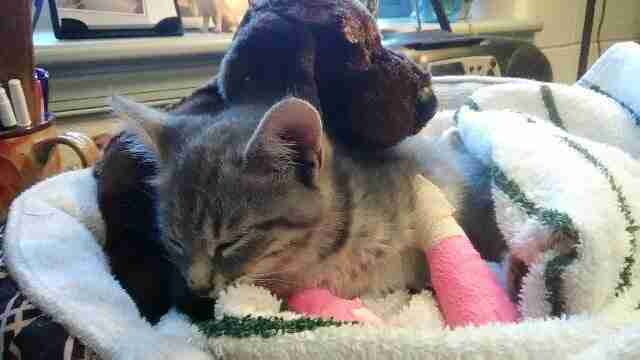 "I love cats ... so I was very determined to save her." 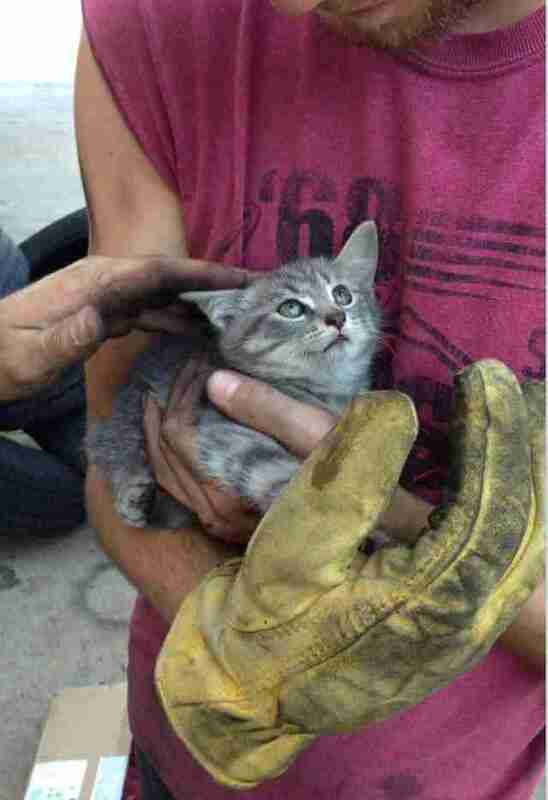 It was just a regular day at a tire shop in Maryland until someone heard a tiny meow. Nick Leland, an employee of the shop, and his coworker realized that the sound was coming from the work truck parked in the lot. 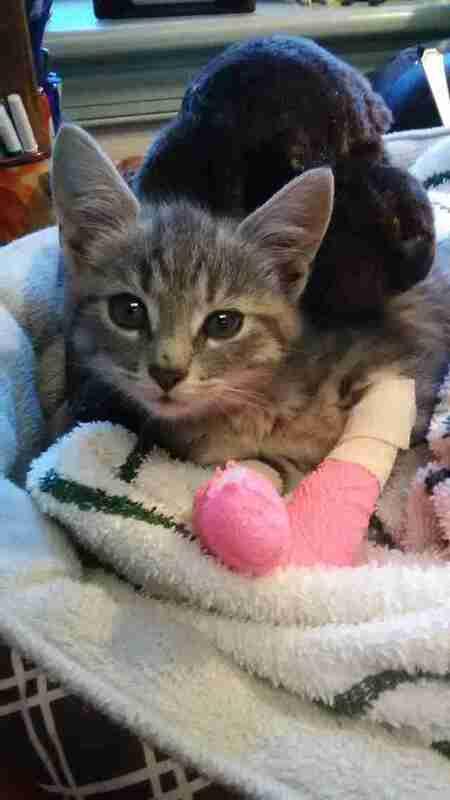 They looked closer and spotted a kitten sitting on the spare tire beneath the truck bed. When they tried to reach for her, though, she got scared. "She ran up the exhaust to the driveshaft, onto the transmission," Leland told The Dodo. "I had her by my fingertips but she climbed up the engine, into the engine fan in front of the engine bay." 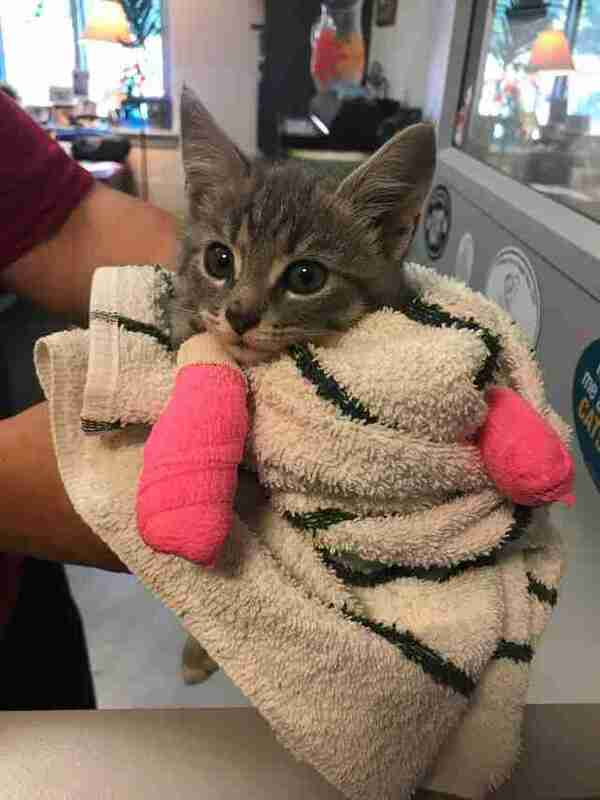 Finally, with the help of his coworker, they had the little kitten cornered and they were able to coax her out and grab her. "I love cats," Leland said. "So I was very determined to save her." 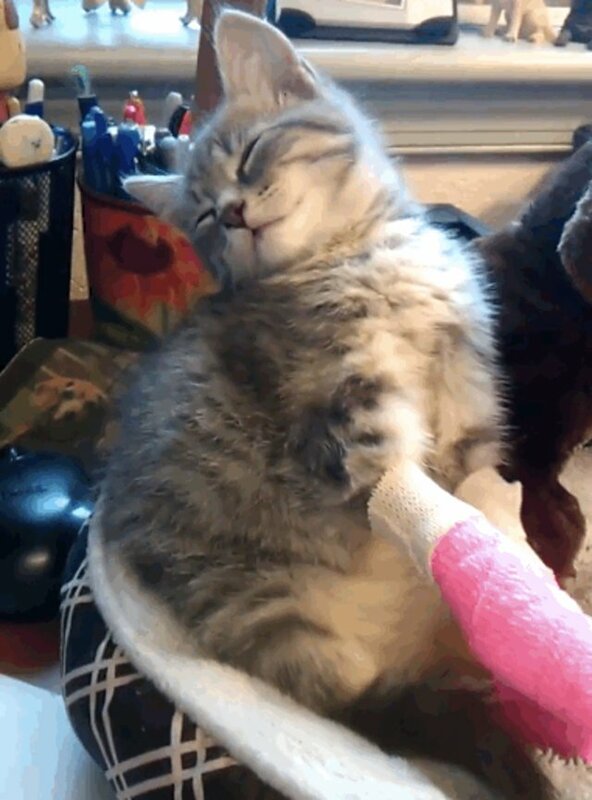 He noticed the poor kitten's paws were a little burned. 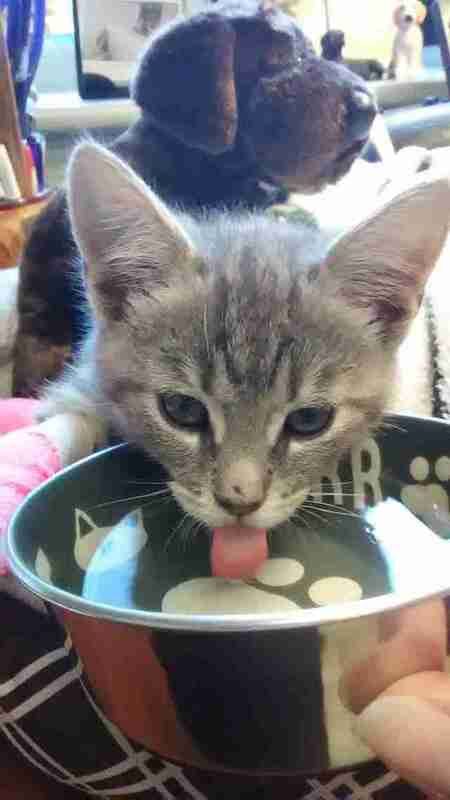 No one knows how she got injured, but she would definitely need some love and care before she could find a home. 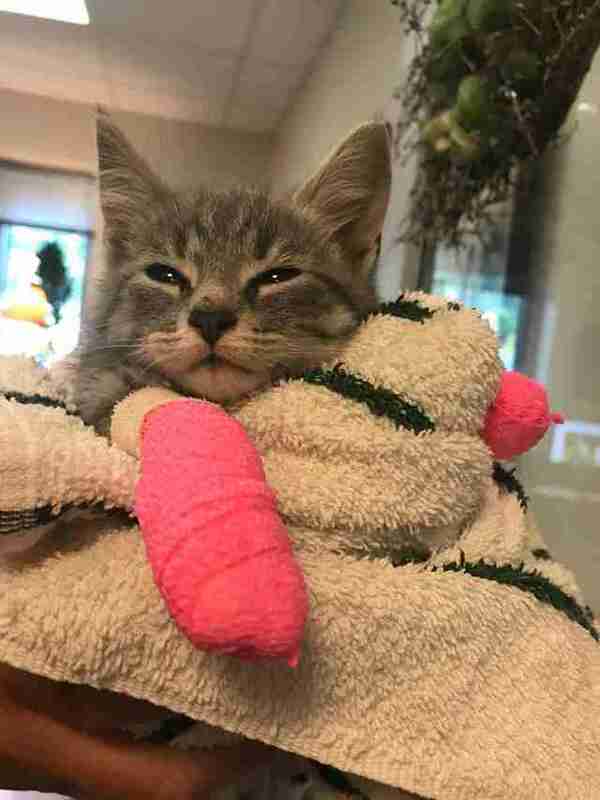 So Leland contacted the people at the Humane Society of Harford County, who were more than happy to give the kitten, named Rims, a place to recover. 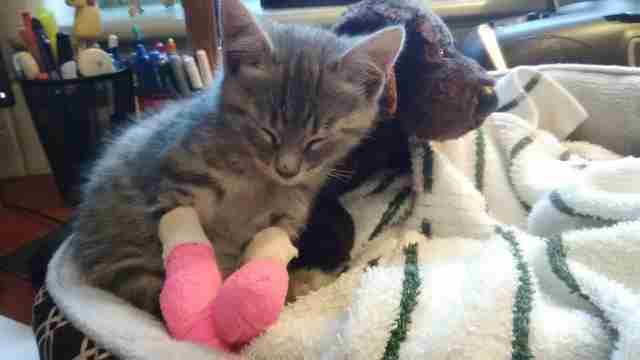 Rims' little paws were medicated and wrapped in bright pink bandages. And because she came in all alone, shelter workers gave her something else for comfort: a furry stuffed dog that she can snuggle with. 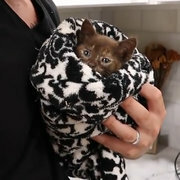 "Kittens that come in without littermates or a mother are given a stuffed toy for comfort," Erin Long, marketing coordinator at the shelter, told The Dodo. Rims is about 7 weeks old, and as soon as she's done with her course of antibiotics and her paws are healed, she'll be up for adoption — probably in about a week. Until then, she's learned to take full advantage of the comfort of the shelter. From what it looks like, Rims now has no trouble relaxing. Leland has three pet cats already — so even though he might have wanted to, he just couldn't give the kitten a home. "I wish we could," he said. Her start in life might have been a rough one, but her future is definitely looking brighter. To inquire about adopting Rims, you can contact the shelter. To help care for animals like Rims who come to the shelter in need of medical care, you can make a donation to the Phoenix Fund.